Employers must make contributions in specified electronic format. SMSFs must be able to receive the contributions in specified electronic format. If SMSF cannot comply, they will not be able to receive contributions (and employers cannot pay Super). Related Party Employer – SIS Definition (Part 8 Associates). What do SMSFs need to do? • Going forward, the Super Choice form will be updated to cover for this for new SMSFs. A new Penalty Regime for SMSFs will apply for contraventions that occur on or after 1 July 2014. • an administrative penalty regime for SMSF trustees for certain contraventions of the SIS Act. 1. Penalty is imposed on trustee or director of trustee company. 2. Personally liable – trustee cannot request that the super fund pay the penalty. 3. Penalty imposed on each individual trustee or once to a corporate trustee. time and provide the Regulator with evidence of the person’s compliance with the direction. and provide the Regulator with evidence of completion of the course. It is expected that the ATO will use the Auditors’ Contravention Report (and other SMSF auditor correspondence to ATO) to ascertain that the fund has contravened one of the relevant sections. 1. From 1 July 2013, ECT in its original form was repealed in relation to Concessional Contributions (CC’s). assessable income, taxing the individual at their MTR less 15% tax offset. 3. Individual can elect to have 85% of their Excess CC released from their Super (no limit on # of requests). 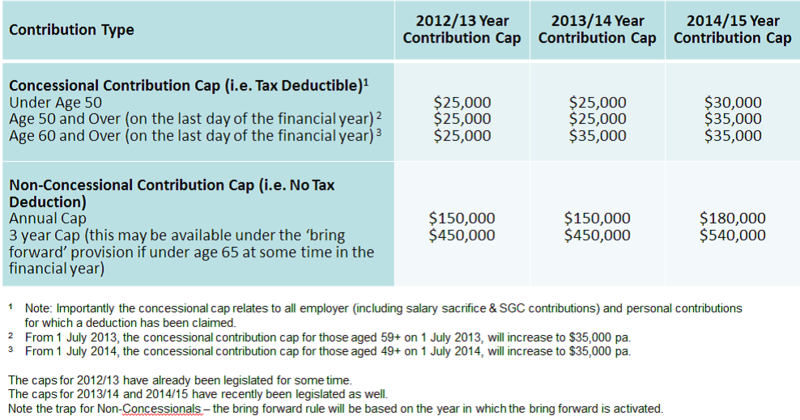 Excess non-concessional contributions are currently taxed at penalty rates – potentially 93%. withdraw the excess component (& associated earnings). industry on the finer details of this measure. Effective from 2012/13 year onwards. • 15% tax applied to concessional contributions if assessable income is in excess of $300k. • It applies to contributions made to Defined Benefit Funds, as well. 1. Will a Zero/Low interest loan give rise to a deemed contribution? whose purpose is to benefit one or more members of the SMSF or all the members in general. D. Ensure there is a temporary transfer of money with the expectation of repayment. 2. Will income be taxed under s295-550 (NALI) if Zero/Low interest loan is in place? Previously, the ATO has said NO. On this occasion, the ATO said YES. 3. ATO stated (in recent Private Ruling) that the income would not have been earned if not for the low interest loan. 3. Can Part IVA apply? No - unlikely. In the recent private binding ruling, the ATO noted “There is no indication that the arrangement will result in persons involved in the arrangement obtaining a tax benefit, nor any indication that the sole or dominant purpose of the arragement is to obtain a tax benefit”. Further…”we do not consider that Part IVA applies to the arrangement”. 4. Will a loan at less than arm’s length interest breach 109 of SIS Act? No. The initial investment or the ongoing investment must be detrimental to the fund. Zero/Low Interest loans are advantageous to the fund, as confirmed in ATOID 2010/162. party loan. In this instance, the ATO took a “holistic” view that it is not a commercial arrangement. If considering zero/low interest SMSF LRB loans in future, consider the implications of s295-550 (NALI). 1. Super Guarantee (SG) rose to 9.25% from 1 July 2013. 2. Super Guarantee will rise to 9.5% from 1 July 2014, and will remain at 9.5% until 1 July 2018. This change is essentially a re-phasing of the eventual increase to 12%. 0.5% rises after that until it reaches 12%. 3. 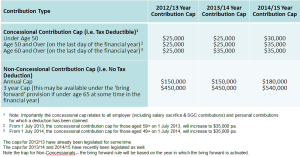 SG for all individuals regardless of age from 1 July 2013. Only SG (no voluntary). No longer age 75 restriction. 4. Low Income Super Contribution (LISC) – Government recommended for this to be abolished. Yet to be legislated. 5. If 2 x outstanding SMSF tax returns – removal from ATO SMSF Lookup. No contributions can be made to SMSF. finalised. Speculation the preservation age will follow the pension age upwards.